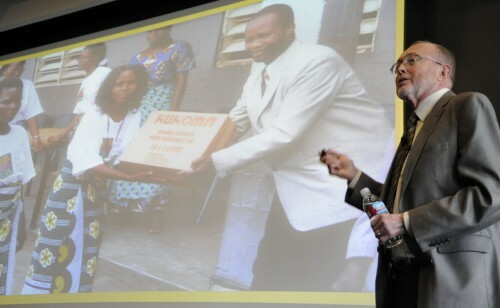 William Rankin, the president and co-founder of the Global AIDS Interfaith Alliance spoke at the Campus Center about “Reaching Rural African Villages with HIV Prevention and Care” in front of a crowd of about 80 faculty and students. GAIA is a non-profit organization that distributes vital HIV prevention and care to African villages particularly the villages in Malawi. “The women who died from HIV in Malawi (rank among) the third highest in the world,” Rankin said. Rankin said many HIV positive women are infected by their husbands. Women and girls are more susceptible to contracting HIV because of the little say they have in their marriages while polygamy is widely practiced among men. Children also suffer directly from the AIDS epidemic. Many households are missing both a mother and a father, and the oldest sibling takes the role of parent. “It spreads easily when people don’t know they are infected and they are not educated,” said sophomore political science major Ryan Taketomo. GAIA strongly believes that educating the Malawi people about prevention is very important. President Stephen Morgan introduced Rankin and Marcus, and thanked everyone who helped contribute to this event and talked briefly about the organization. “I think we did good with the turnout of students and faculty,” said Kenneth Marcus, associate professor of history. Rankin focused on the word “Interfaith” in the beginning of his lecture. He wanted people to know although the GAIA organization works with religious organizations, GAIA is not a religious organization. GAIA helps villages in Malawi in fighting AIDS by teaching the importance of using condoms and encouraging people to get tested. During the lecture, Rankin showed various images of the people and types of prevention care in Malawi. One slide was of a brother and sister who are twins, but the brother was dramatically shorter than his sister because of malnutrition. Malnutrition and malaria are a huge problem in Malawi. People in Malawi are not often treated for HIV because there is a lack of nurses in Malawi who can assist in HIV prevention. GAIA is committed to helping women who want to be trained nurses by providing the Nursing Scholarship Fund. Rankin said women with scholarships receive tuition, living allowances, two pairs of shoes, uniforms and much more. When women graduate from nursing school, they work in hospital and clinics to aid others in the fight against HIV and other illnesses related to AIDS. The hospitals give vital HIV tests, treatment, and antiretroviral therapy. While the mobile health clinics provide people with easy access to treatment. These hospitals and clinics help save countless lives but Rankin also believes in the power of the next generation. Rankin’s last slide was of eight babies who had clothing on that read Thank You. The message was simple: children are the future. For more information on GAIA visit www.thegaia.org. Tiffany Spears can be reached at tiffany.spears@laverne.edu.